Wide open backpack is perfect lightweight canvas backpack for working, traveling, school and daily using. * Generous enough to accommodate the magazine,laptop,tablet, glasses, wallet, keys, earphone, power bank, cell phone, document and clothes. * Stylish backpack made of eco-friendly stripe canvas, soft and fashionable, classic and minimalist design really stands out from the crowd! * With two sides pockets , one big front zipper pocket and one interior security zipper pocket suit for your practical needs. * Unique easy access doctor bag-style opening with vertical zipper in backside, provide quick access to the main compartment. * Spacious main compartment with large capacity ample room for your books, notes, computer, supplies or clothing, etc. * With adjustable padded shoulder straps, provide comfort carrying. * Perfect casual daypack for working, traveling, school and daily using. The womens backpack is made of lightweight 100% stripe cotton canvas, size:10.5" x 8" x 15.7",capacity: 21.6L.perfect working, business, traveling, school and daily using. Large Backpack Generous enough to accommodate the magazine, 14" laptop, tablet, glasses, wallet, keys, earphone, power bank, cell phone, document and clothes. It will be a perfect school bag for Men, Women, Teens, Boys and Girls, Elementary School, Middle School, High School and College Student. 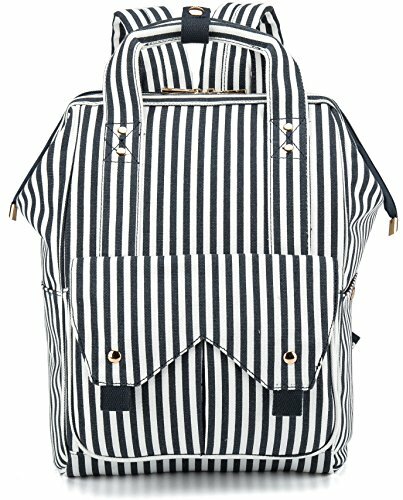 Also as a stylish Nappy Backpack, Baby Diaper Backpack for Dad or Mum. If you have any questions about this product by BTOOP, contact us by completing and submitting the form below. If you are looking for a specif part number, please include it with your message.